State regulators have ordered the owner of a pipeline that experienced a catastrophic explosion last month to fix inadequate erosion control measures in several locations along its route. The Pennsylvania Department of Environmental Protection gave Energy Transfer Partners, which owns the Revolution Pipeline, four days to make the fixes along the pipeline’s route, which goes through four counties in western Pennsylvania. Officials say heavy rains led to a landslide that caused a section of the Revolution Pipeline to blow up in September in Center Township, Beaver County, burning one house to the ground. After the explosion, inspectors with the Pennsylvania Department of Environmental Protection inspected the line, interviewed workers, and subpoenaed documents to judge whether Energy Transfer Partners, the pipeline’s owner, was meeting all its permit obligations. It was not, the agency says. DEP spokesman Neil Shader said inspectors found unreported landslides and erosion off the pipeline’s construction sites into nearby streams. “Currently there’s potential for additional pollution…there’s runoff impacting these streams already — and that’s why we’ve issued the order,” said Shader. The inspections along the route took place Oct. 22 through Oct. 25, and the order was issued Monday. In total, the DEP found six streams in Beaver County where construction conditions had resulted in sediment pollution into the streams. The department also found that the company had failed to submit reports detailing areas where its anti-erosion measures failed. Shader said future enforcement actions are possible, but declined to comment on whether the company would be subject to fines. An ETP representative said the company is complying with the order. “We remain in contact with the PA DEP and have and will continue to comply with their orders,” Alexis Daniel said. The order gives ETP until Nov. 9 to provide a detailed plan for controlling erosion along its route. 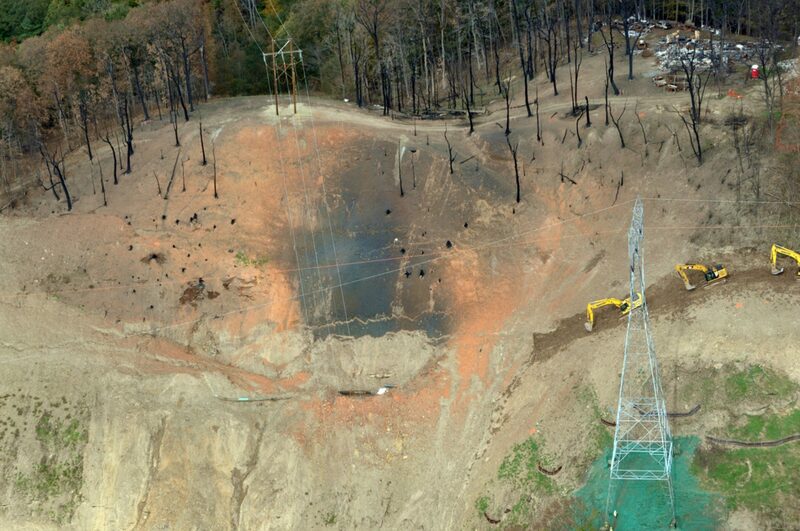 The Public Utility Commission continues to investigate the cause of the Sept. 10 explosion. The pipeline had been in operation for only a week when the blast occurred. The Revolution pipeline is a 24-inch natural gas gathering line, a type of line that typically transfers gas from wellheads to a larger transmission line. It was built to feed two major ETP pipelines, the Rover pipeline and the Mariner East 2 natural gas liquids line. In June, the company agreed to pay a Department of Environmental Protection fine of $145,250 for discharging “sediment-laden runoff” into Raccoon Creek and an unnamed tributary.